A common task for newbies is to learn how to do a SQL convert date and work to convert them date to other data types or covert other data types to Date. Here in this article we will explain how to work and convert dates to different formats or vice versa. The first example will be simple, we have a varchar column with a date in a table, but we need to convert the varchar to date. We need to do a SQL convert date. We want to convert the column date from nvarchar(100) to a date. 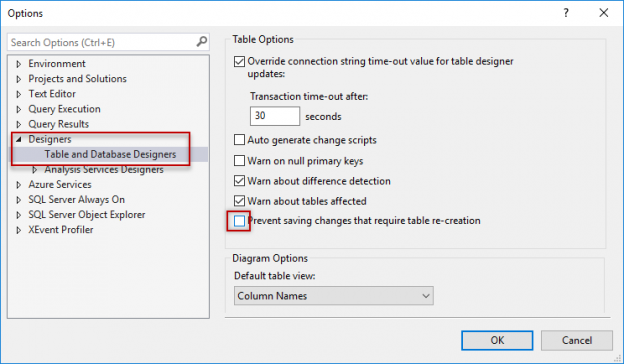 This option will disable to option to prevent saving table recreation. When you modify the column data type, it requires table re-creation. T-SQL contains functions to convert data types. We will use CAST and CONVERT to do a SQL convert date. The example declares a variable named vardate and then this variable that is a varchar is converted to datetime using the CAST function. CONVERT is a function that can do the same than CAST in the previous scenario. The T-SQL code is doing the same than cast, but it is using the CONVERT function. The advantage of CONVERT is that you can easily change the format of the date using the style argument. The following example shows how to convert the date format in different formats. FORMAT is easier to handle dates and use the format of your preference, because you do not need to know the style. However, in my experience I see a lot of code using the CAST and CONVERT functions so, it is better to know them. You need separators for the date like a “/”, a “.” or a “-“. We use substring to concatenate the “-” to use an acceptable date format and then we use the CONVERT function to convert the characters to sql date. If you use the CONVERT or CAST to convert a datetime to integer, it will return the number of days since 1900 until the date provided. In this article, we learned how to do a SQL convert date in SQL Server. We learned how to modify the data type in a table, how to use the CAST, CONVERT and FORMAT functions. We also learned about the different types of SQL data types. Daniel Calbimonte is a Microsoft Most Valuable Professional, Microsoft Certified Trainer and Microsoft Certified IT Professional for SQL Server. He is an accomplished SSIS author, teacher at IT Academies and has over 13 years of experience working with different databases. He has worked for the government, oil companies, web sites, magazines and universities around the world. Daniel also regularly speaks at SQL Servers conferences and blogs. He is also a writer for SQL Server training material for certification exams.